SCVHistory.com | Directions to the St. Francis Dam Disaster Site (2016). The St. Francis Dam was located approximately 7.2 miles north of today's intersection of Copper Hill Road and San Francisquito Canyon Road in Saugus. To get there (as of 2016), type "St. Francis Dam Disaster Site" into Google Maps or [click here]. The upper road identified as San Francisquito Canyon Road is the one you drive on. About a mile past the stop sign at Stator Lane (the Powerhouse 2 community), you'll see an open dirt area and K-rail off to the right. 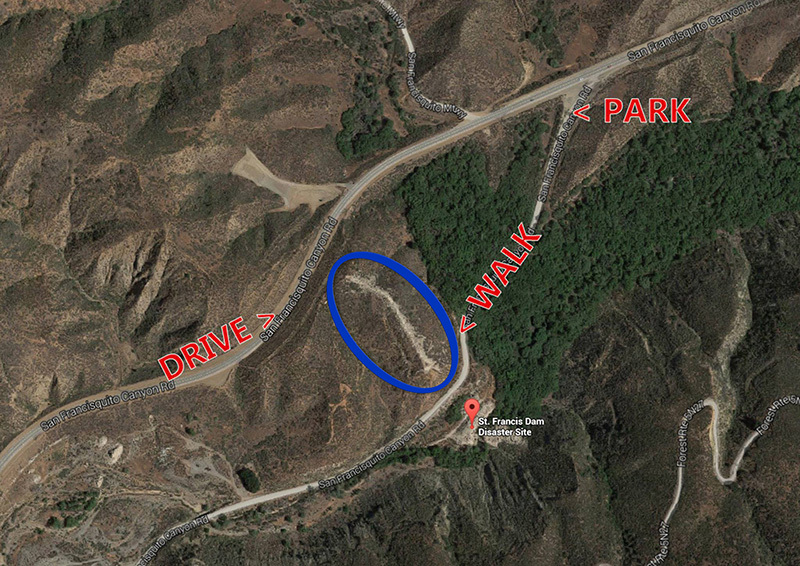 Park in front of the K-rail and walk down the lower road identified on the map as San Franciquito Canyon Road. The pinpoint on the map that says "St. Francis Dam Disaster Site" is the location of the dam itself. You'll see a mound of rubble where the "Tombstone" stood. The wing dyke at the top of the hill (the west abutment) is circled in blue.